Petal Perks Rewards Information | Royer's flowers and gifts - Flowers, Plants and Gifts with same day delivery for all occasions. Petal Perks is an exciting rewards program for earning a discount off a future purchase by simply shopping at Royer's flowers and gifts! The more you shop, the more you can save! For every order, you receive one (1) point for every cent ($0.01), plus you earn 300 bonus points per order. You can redeem your points for a discount on a future order. 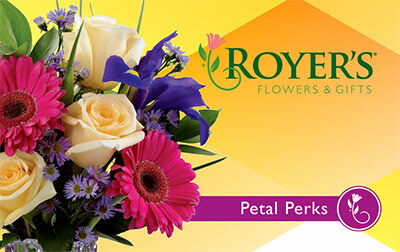 If you have a Royer's flowers and gifts house charge account, you are already automatically enrolled in Petal Perks. Your charge account number is your Petal Perks account. You will be offered the opportunity to sign up for Petal Perks during checkout online, in-store and over-the-phone. You will be offered the opportunity to sign up while placing your order. If you already have a Petal Perks or House charge account number, enter your account number during check out online, mention your account number when placing phone orders or show your Petal Perks rewards card when shopping in-store. For every order, you receive one (1) point for every cent ($0.01), plus you earn 300 bonus points per order. You must earn 15,000 points before you can redeem for a merchandise discount. The reward redemption is a tiered system: 15,000 points can be redeemed for $5.00 off your purchase, 25,000 points can be redeemed for $10.00 off your purchase, 40,000 points can be redeemed for $15.00 off your purchase and so on. Once you reach 15,000 points, you will be given the ability to redeem points for discounts on your order. Online, the option to redeem is given on the Summary page (right before you enter your payment information). When placing an order in-store or over-the-phone, you will be made aware of any rewards available to redeem by our friendly sales associates. Your points will expire if you do not make 2 purchases in one year or your house account becomes 90 days overdue. Occasionally, you may earn extra promotional points that do expire in a certain amount of time. This information can be seen in your Petal Perks account information online. Can I View My Points Online? Yes! Visit royers.com and click on "My Account." Under the "Petal Perks" subheading, click "Overview and History" to view your current accumulated points, transactions and promotional points earned. I Already Receive a Discount. Do I Earn Points? No. Accounts that have pre-existing discount arrangements with Royer's flowers and gifts are not eligible. Earn points for each purchase. 1 point = $.01 in purchases including delivery charges. Points are earned on the total value of the order minus any discounts. Earn points for each order or cash and carry sales. Each Transaction = 300 Points. Points expire after 1 year with less than 2 purchases. For delivery or will call orders: points will appear on your account the next business day after the order is delivered or picked up. For in-store "cash & carry" purchases: points will appear on your account the next business day. Points have no cash value and can only be redeemed for discounts on future purchases. Points cannot be used to pay house account balances. Guest Checkouts on royers.com cannot earn or redeem points. Program began October 1, 2014. Purchases made prior to October 1, 2014 will not earn points. We reserve the right to modify or cancel the program at anytime, for any reason.